About 200 people today gathered to watch the Queen arrive at a church service on the 59th anniversary of her accession to the throne. The Queen chatted to wellwishers and accepted flowers from children after attending the service at the St Peter and St Paul church in West Newton, Norfolk, with the Duke of Edinburgh. Security was tight, with more than 20 police officers keeping a close eye on crowds gathered outside the church. The Queen and Duke of Edinburgh have spent Christmas and the new year in the royal residence at nearby Sandringham. They are due to return to Buckingham Palace in London tomorrow. George VI, the Queen’s father, died in his sleep while staying at Sandringham early on 6 February 1952. She was crowned at a coronation ceremony in Westminster Abbey on 2 June 1953. Royal gun salutes are usually fired around the country on accession day. This year, they will be fired at noon tomorrow because accession day has fallen on a Sunday. 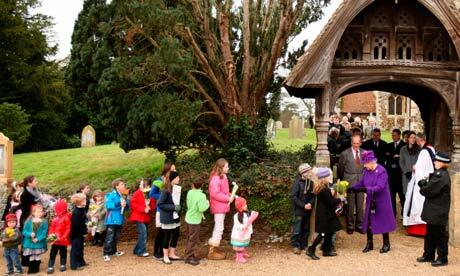 via Queen marks accession day with church visit | UK news | guardian.co.uk. What an Irish Terrorist Teaches Us About Tolerance – Newsweek. American Thinker: Sharia Law in Canada and Britain. 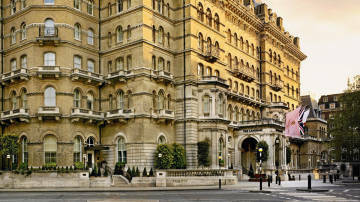 Go left, young man: Driving in Great Britain and Ireland < Travel & Tourism | Expatica Germany. 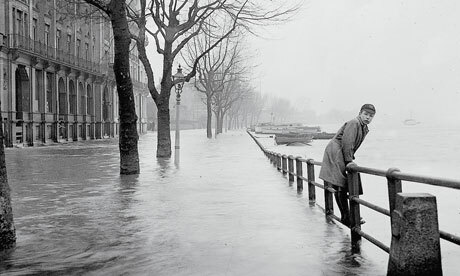 Lives & letters: Tony Judt on growing up in Putney | Books | The Guardian. A British grande dame puts on a new face – The Globe and Mail. It is sadly unsurprising that Prime Minister Cameron’s highly publicized trip to Turkey went with no mention of that country’s continued denial of the Armenian Genocide, and its suppression of Kurdish and Armenian minorities. Indeed when Turkish leader Erdogan discussed his threats of ethnically cleansing Armenians in the UK, Gordon Brown made no more comment on the matter than if Erdogan had been discussing his favorite television programs. It is in keeping with that conspiracy of silence, that Cameron made no mention of the thousands of political prisoners in Turkish jails, there often for merely expressing an opinion at odds with the state, for singing a folk song, or delivering an official speech in Kurdish. Naturally Cameron did not think to raise the issue of Leyla Zana, the first Kurdish woman elected to the Turkish parliament and a winner of the Sakharov Prize, who is still in jail today. Cameron could have at least raised the subject of Aysel Tuğluk, a member of the Turkish Human Rights Association, who was illegally stripped of her parliamentary immunity and sent to jail for handing out leaflets in the Kurdish language, and is now due to be sent to jail yet again. But rather than standing up for human rights, Cameron instead pandered to the radical Islamists who were his hosts, by feeding their appetite for hate directed at Israel. And it did not begin or end with Israel. Instead Cameron sold out the rest of Europe, declaring that he was “angry” at how long the negotiations to bring Turkey into the EU were taking, and declaring himself the “strongest possible advocate for EU membership”. He slammed France and implicitly Germany, for refusing to rush forward to support bringing Turkey into the EU. Cameron sided with Turkey, over France and Germany, betraying allies for enemies. And worse was yet to come. Not only did Cameron ignore Turkey’s ongoing occupation of Cyprus, but he signed a strategic agreement with Turkey that calls for ending the “isolation” of the Turkish Cypriots by upholding their “right to representation” in the European Parliament, and promoting political and cultural contacts with the Turkish Cypriots. What that means is that Cameron committed himself to supporting Dervis Eroglu from the radical National Unity Party, which calls for Turkish annexation of occupied Cyprus. The strategic agreement signed by Cameron, moves the UK closer to recognizing the Turkish occupation of Cyprus, which currently only Turkey itself recognizes. Again Cameron makes no criticism whatsoever of Turkey’s illegal occupation of Cyprus. He does not mention the fact that he signed an agreement promoting the flow of goods from occupied Cyprus to the UK, while Turkey refuses to accept goods from Greek Cyprus. Of course not. No more than his predecessor was willing to. Did Cameron do any of this out of principle? Nonsense. Cameron knows as well as anyone about Turkey’s state of domestic terror, its persecution of the political opposition, and how unworkable Turkish membership in the EU would be. Instead like Brown before him, Cameron pandered to the Turkish thug-in-chief for a few pounds, hoping to boost British exports to Turkey. In the hope of a few million pounds, Cameron betrayed fellow European nations, signed off on Turkey’s occupation of Cyprus, ignored the thousands of political prisoners in Turkish jails, and whitewashed Turkey’s real record on Islamic terrorism. And while he and his businessmen friends beamed and shook hands with Turkey’s chief terrorist– others were left to stand up against the violence and brutality of the Turkish regime on their own. In his rambling speech, Cameron praised Turkey for fighting against terrorism. The reality however is that the only “terrorism” that Turkey fights against, is Kurdish guerrillas, from its large Kurdish minority who want to have their own state, or at least some basic human rights. And when Cameron shook hands with Erdogan, he was shaking hands with a man whose patron, Yassin Qadi, funneled millions of dollars to Al Queda, and whose own advisor, Cuneyt Zapsu, donated 300,000 dollars to Al Queda. Al Queda operates its magazine freely in Istanbul, which is convenient because Erdogan claims there’s no such thing as Islamic terrorism. If Turkey, as Cameron says, is guarding the flank of Europe… then who in G-d’s name is guarding Europe from Turkey? Certainly not Cameron. Cameron’s despicable toadying to Turkey’s Thug-in-Chief was one long collection of lies. In his speech, he claimed that “Europe will draw fresh vigour and purpose from a Turkey that embraces human rights and democracy”. Turkey’s democracy is such that its opposition is routinely jailed. Its human rights has sent 12 year olds to prison for singing folk songs. It has no concept of democracy or human rights. Its 10,000 political prisoners could testify to that. Almost a 1000 of them opposition politicians. The sham continued as Cameron congratulated Turkey on “its efforts to achieve the ambition of zero problems with all its neighbours, including Iraq”. This after Turkish troops repeatedly invaded Iraq just just last month, murdering a 15 year old girl, among others. The Iraqi government protested, to no effect. Cameron, who is supposed to be committed to guaranteeing Iraq’s security, instead shamelessly praises the invaders. The only casualties he mentions are those of the Turkish invading forces, not their victims. Never their victims. And so it goes. Cameron babbles on about Turkey’s religious tolerance, while the level of hateful incitement spirals out of control. He talks about the true tolerant Islam, to a man who was at one point imprisoned for his own Islamic radicalism. He takes up arms against all those damned obstructionists who are preventing a lovely regime like Erdogan’s Turkey from joining the EU. He vows to fight them everywhere, like a latter day Churchill, proclaiming not, “There will always be an England”, but rather, “There will always be a Turkey in the EU”. If there was any Turk in that room who had the slightest respect for England before Cameron began to speak, it was sure to have vanished in a whiff of contempt. Cameron’s speech reminds one of English socialists visiting the Soviet Union and heaping praise on Stalin and the wonderful revolution, before going off to collect their blood money. And now Cameron has done them one better, demanding that a radical Islamist regime share open borders with the EU. In a speech given while Erdogan prepares to round up political opponents before the election on fraudulent charges of “inciting” Kurdish riots– Cameron made only one criticism of human rights. Not of Turkey of course. Or of Erdogan, who has jailed about as many of his opponents as Saddam Hussein. No, Cameron courageously blasted Israel, for standing up to Erdogan’s IHH thugs, after they beat and stabbed Israeli soldiers inspecting their flotilla carrying aid to Hamas run Gaza. Cameron blasted the response of Israeli soldiers who fired back after they Turkish Islamist thugs tried to murder them, as “completely unacceptable” and called Gaza, a “prison camp”. He demanded a “swift, transparent and rigorous” inquiry. No such demand was of course issued to his hosts for their 10,000 political prisoners, their illegal invasion of Iraq and murder of civilians– or that Armenian genocide matter. Of course no inquiries are demanded there. It is mainly young people who take to the streets, with Turkish flags in their hands, whistles in their mouths and hatred in their eyes. “We have waited long enough,” reads one poster. “Allah wants this war,” is the message on another. European tolerance Islamized Turkey. The pandering of unprincipled leaders like Cameron will take it to the brink and beyond. Do You Want to Survive? When Mummy went to live with Jesus | Life and style | The Guardian.